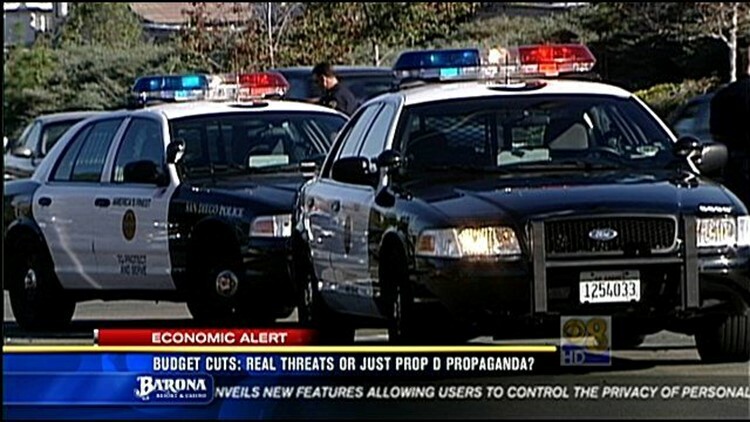 SAN DIEGO (CNS) - Police Chief William Lansdowne Wednesday presented a bleak portrait of the public-safety repercussions of cuts he will soon have to make in his already bare-bones department in the absence of new revenue. As directed by Jay Goldstone, the city's chief operating officer, Lansdowne detailed his proposals for slashing $15.9 million from his fiscal 2011-12 spending plan in the event that new municipal income sources cannot be secured. The only immediate prospect for such a funding influx is Proposition D, a proposed ballot measure that goes before voters next month. The initiative would raise about $103 million a year through a half-cent sales tax hike. Noting that he was prohibited by law from making statements that could be construed as campaigning, Lansdowne urged the public to back Mayor Jerry Sanders' "plan" to address the city's projected deficit of $72 million in the coming year. Sanders is strongly advocating passage of the five-year sales tax, which would only go into effect after 10 "reform" measures are implemented. The police chief warned that the prospect of further reductions in his department -- most notably the loss of 162 sworn officers -- is "threatening the very lifeline of safety in the city of San Diego." "And that public safety is (in danger of) being sacrificed as we speak," he said during a mid-afternoon briefing at downtown SDPD headquarters. Speaking forcefully and at times seeming close to exasperation, Lansdowne -- who said he'd been asked by the mayor to "speak with my heart" -- emphasized repeatedly that San Diegans will see significant downgrades in police protection should the proposed cutbacks go into effect. "These cuts are real if we don't find a solution," he said. In addition to closing two stations, the department, which had to let go of 133 sworn personnel last year, would likely have to shift gang, homicide and narcotics detectives into patrol duties, along with homeless outreach and juvenile services officers, officials told reporters. The number of layoffs would equal 10 percent of the SDPD's patrol operations, according to Assistant Chief Boyd Long. "I can't tell you how critical this is to the Police Department," Long said. Dispatch personnel also would have to be laid off, according to Lansdowne, who said the department "dropped" an estimated 100,000 emergency calls last year due to previous staff cuts. "I've cut everywhere I can cut," the chief added. "There's nowhere else to cut." On Tuesday, fire Chief Javier Mainar outlined $7.2 million in proposed cuts that could result in the sidelining of additional fire engines and laying off firefighters in the upcoming fiscal year. Mainar's recommendations include eliminating staffing for a seasonal firefighting helicopter, instituting service-reduction "brownouts" for five additional engine companies, laying off up to 60 firefighters and cutting some lifeguard protection. "In considering all that has been done so far, and our remaining resources, I have concluded that the only realistic way to meet the FY 2012 reduction target is to make further reductions in our fire and lifeguard operations divisions," Mainar wrote. This fiscal year, the city instituted its much-maligned fire-service "brownout" program, a last-ditch measure that idled eight engine companies on a rotating basis in an effort to save about $11.5 million.